For those who wish to experience the natural environment at its best there is no better place to visit than Nepal. Nepal is a country of exceptional biodiversity and a beautiful natural environment. The tropical jungles of the Terai preserve some of the best wildlife habitat in the subcontinent. The mountainous country also shelters some of the world's most rare animals. Sagarmatha (Mt. Everest) National Park and Royal Chitwan National Park with typical natural, cultural and landscape characteristics were listed as World Heritage sites in 1979 and 1984 respectively. 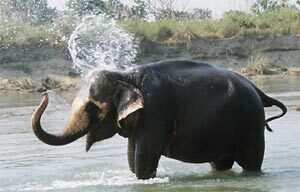 The Koshi Tappu Wildlife Reserve, a wetland of international significance, was declared a Ramsar Site in 1987. Nepal has 16 Parks (National Park, Wildlife Reserves and Conservation Areas), occupying 16% of its total geographical area. Jungle safaris on elephant ride or jeep drive are offered at the Parsa Wildlife Reserve, Royal Chitwan National Park, Royal Bardia National Park and the Royal Suklaphanta Wildlife Reserve, all of which are located in the low plain land. National parks located specially in the Terai region in the Nepal which attract visitors from all over the world. And a visit gives close up opportunities to view animals as well as experiencing the wilderness. Jungle safari involves game, jungle walk, dugout canoes trips. You ride on an elephant's back or on a four wheeler jeep accompanied by a fully trained guide (also known as expert Naturalists) for the love of nature and animals. In Nepal, Chitwan and Bardia are two hot dishes on the menu. 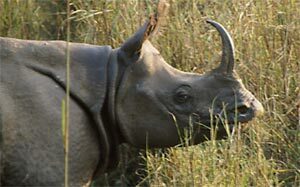 Chitwan accommodates more than 43 species of animals. Among all, the endangered one-horned rhino, Royal Bengal tiger, Gharial crocodile, four-horned antelope, striped hyena and the Gangetic dolphin are the main attractions here. Come explore the jungle with us!